The Ritual of Mara can be performed at any Shrine to Mara. 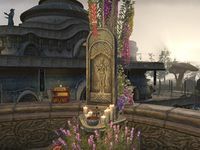 It requires a Pledge of Mara, a Crown Store item that can also be obtained by purchasing the Imperial Edition. The pledge must be quickslotted to activate, and will send your partner a notification to begin the ritual. Should they accept, both of you will receive a Ring of Mara, which results in an experience bonus when you group together. A character can perform the Ritual of Mara with up to eight other characters. 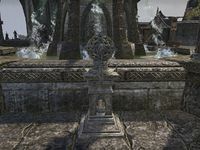 Players who copied their account to console after using a Pledge of Mara on PC were allowed to keep their rings, but the experience bonus will only work on console if their partners also purchased an account copy. "At this altar to the Goddess of Love you can use a Ring of Mara to espouse your beloved." "At this altar to Almalexia you can use a Ring of Mara to espouse your beloved."